I am so happy that Danberry asked me back to write another style blog! 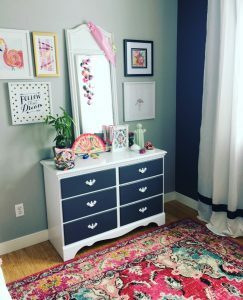 When it came time this past summer to redo my daughter’s bedroom into her dream “big girl” room, at first it felt overwhelming. So many ideas…but where to begin? I never dare look at Pinterest. EVER. Pinterest would be a deep black hole that I would likely never crawl out of. 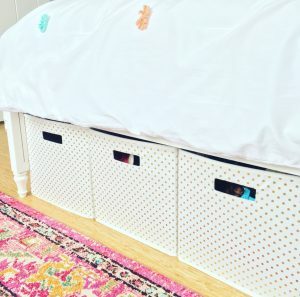 You would find me weeks later unshowered, with a crazed look in my eyes, real estate career dunzo, looking at pictures of DIY beds that look like Cinderella carriages. First, I knew I didn’t want to paint. I love to start with a neutral palette and build. If the point is to create a room that can grow with them into their adolescent ( Gag. Vomit. My baby…no.) years, resist the urge to go crazy with wall colors. Simplicity. 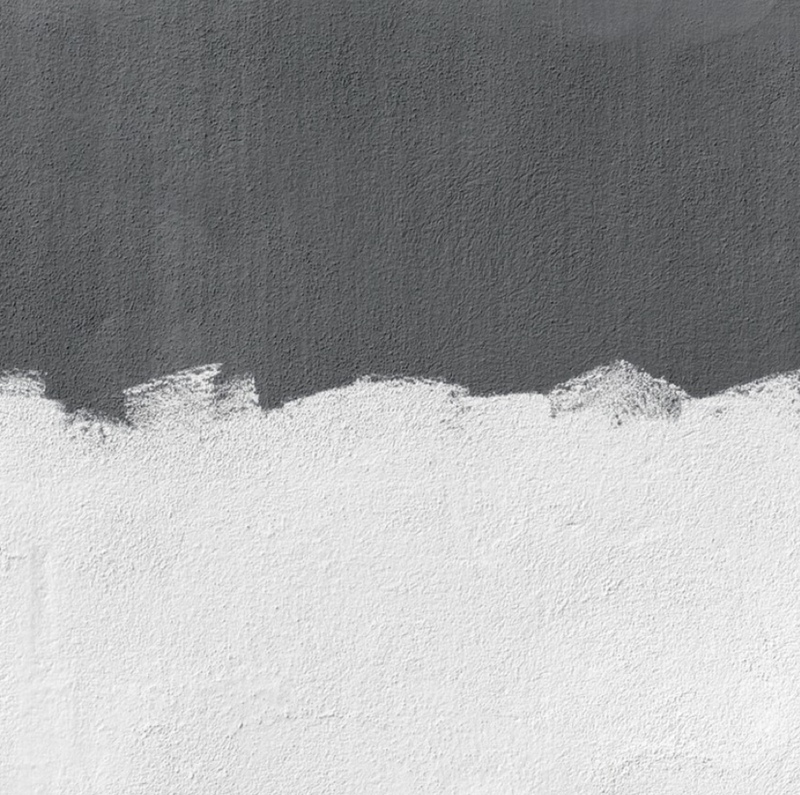 I am super partial to white or grey walls and adding color and personality elsewhere (more on that later). 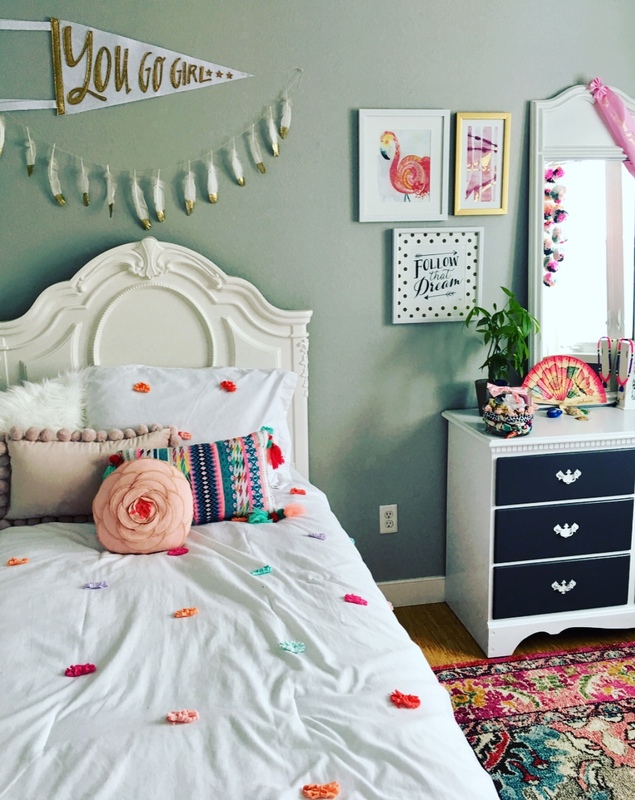 It may seem like a swell idea to spend an entire weekend, taping off, and painting pink stripes on your little Princess’s walls, but in two years, when her favorite color is yellow…? Make it easy on yourself and leave the walls alone. A lot easier, and less costly, to switch out a pair of pink curtains, than pink paint. Pick a statement piece, not a theme. I do not like themes. Theme parties, themed décor…I do not need to see a nautical theme unless I am on a beach, right?? 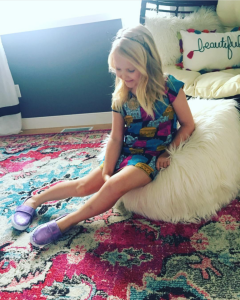 Isla’s room started with a rug. It’s a beautiful rug. 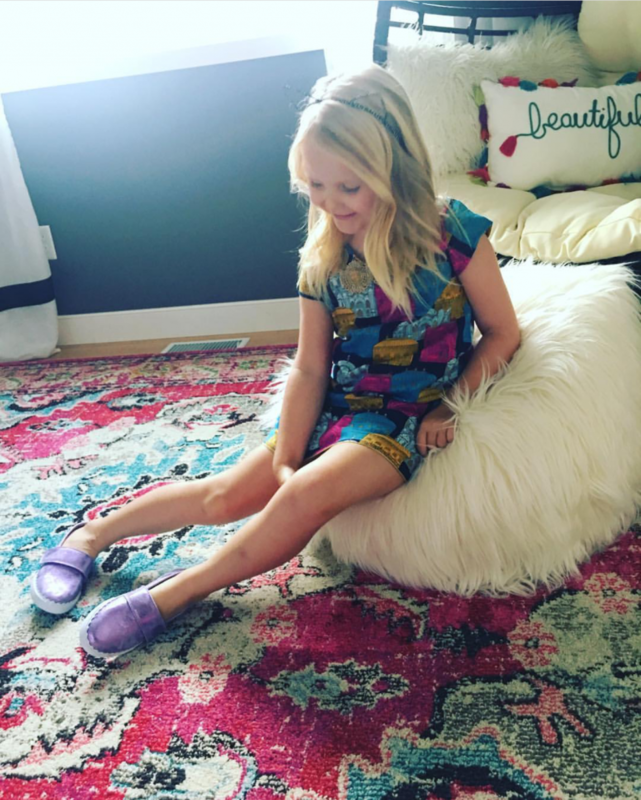 It is all her favorite colors: pink, purple, blue, “sparkly white”, (when you are 5, sparkly white is a color). 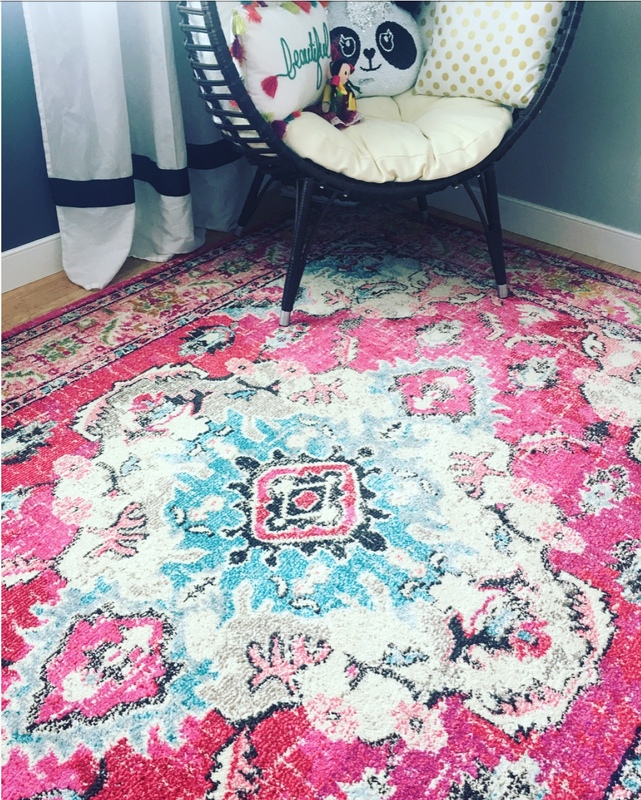 This rug could just as easily go in a living room. It’s sophisticated yet playful, and because it is not specifically a “kid’s room rug”, it will last her for many years. 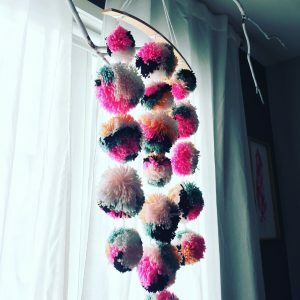 When you choose your statement piece, the rest of the room just kind of falls together. 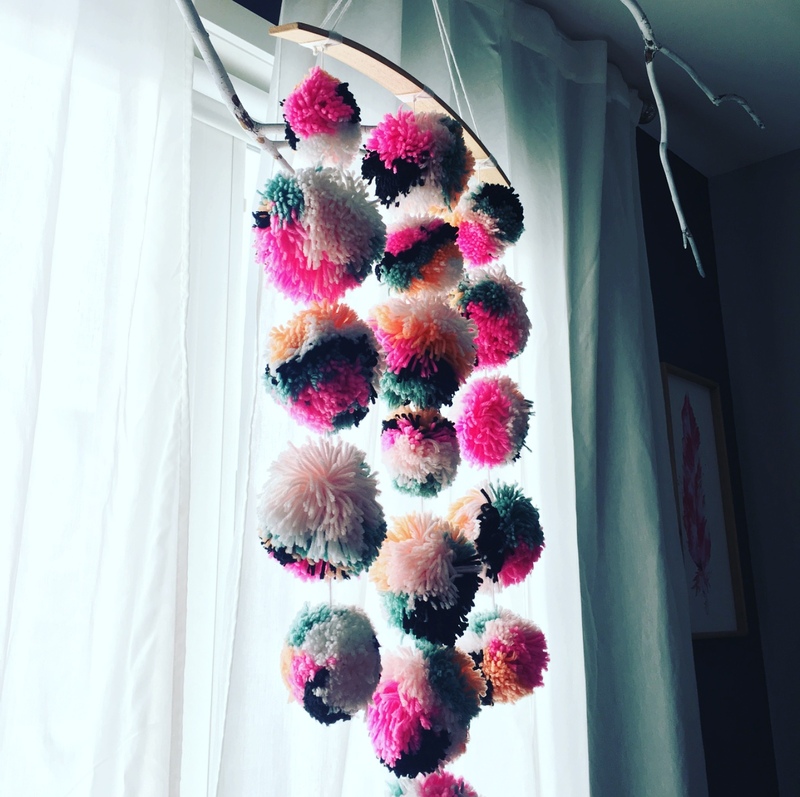 The rug led to a chair, and the chair led to a large, yarn pompom mobile…let it happen organically. 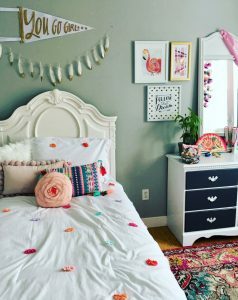 A few pieces of artwork, bedding, accessories, a few pillows…none of it matches per se, BUT, it all ties back into that beautiful rug. There is no theme. There are no Disney princess prints, Barbie curtains, or Shopkins bedding. Sure, Isla loves all those things now, but will she in a year? I will repeat. Storage is EVERYTHING. You can spend thousands on adorable Land of Nod furniture and accessories, but the room will still look a whirling, violent, filthy, toy tornado without the right storage. Everything needs a place, and that place is not in the middle of the room in a pile, (side eyes looking at you, Isla London…). A fellow realtor and friend came over for the first time a few months ago and glanced around with a confused, and possibly impressed, look on her face and asked, “Uhhhh, so, Jen…do you not have custody of your children…?? Ummm…are they rented social media props?” Of course, the hyper organized, Type A, portion of my brain LIVED for this and took this as the highest compliment. Crazy as it may sound, it is possible to have 2 small children AND a clean, stylish home, IF you have proper storage. One of the smartest things I did in Isla’s room was to get her a trundle bed, minus the trundle. It sits a little higher, so it fits full size canvas storage bins underneath. Those stupid bins are some of the best money I have ever spent. She has a bin for Barbies, one for princess dolls, one for random plastic junk: L.O.L. Dolls, happy meal toys, “treasures” she brings home from her grandma’s house…if you are a mom, you know exactly what I am talking about. Collect pieces over time. 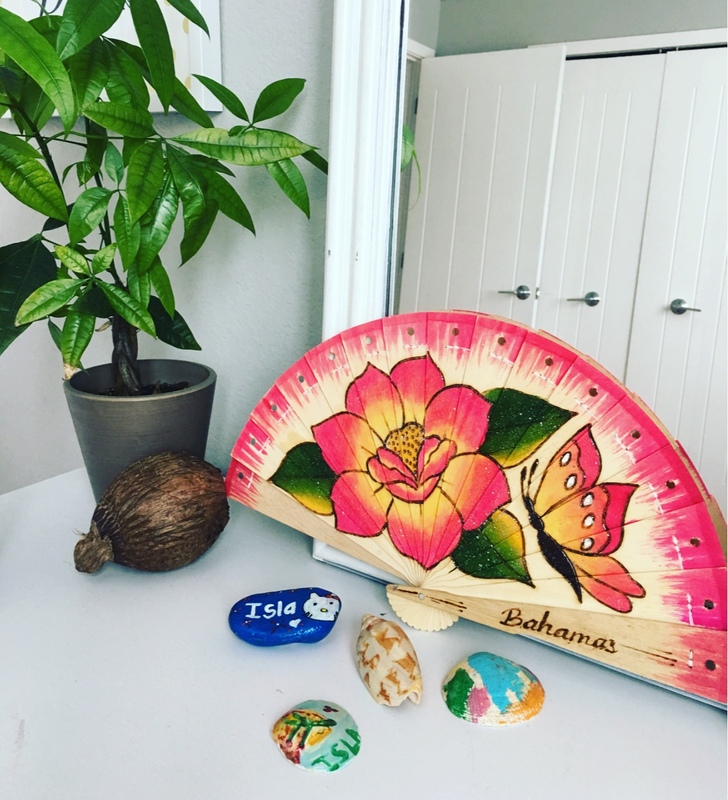 Accumulate individual pieces when you come across something special instead of buying a matching furniture set. 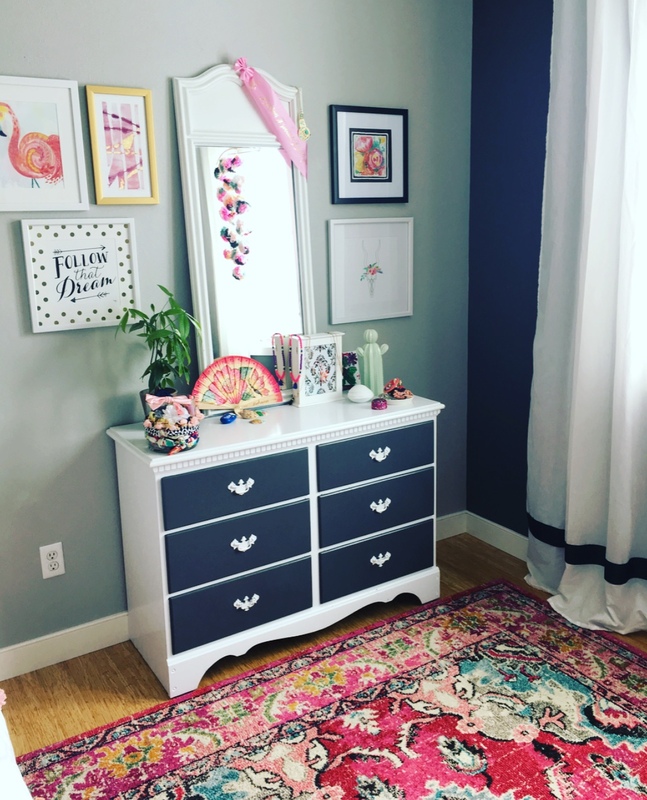 Not only is it an excellent way to save, but in the case of Isla’s room, it achieves a colorful and eclectic look, layering in the new with the old. When she is older and needs a larger bed, I will only have to replace that, and not an entire bedroom of furniture. 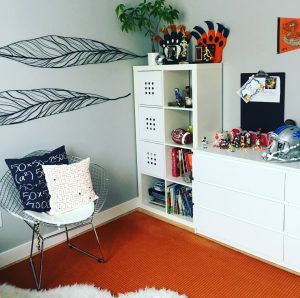 In the vein of making things last past the toddler stage, I also recommend buying full size furniture, as opposed to child sized things that have only a small window of use. My daughter has an incredible teardrop shaped chair in her room that she loves to put her stuffed animals in. 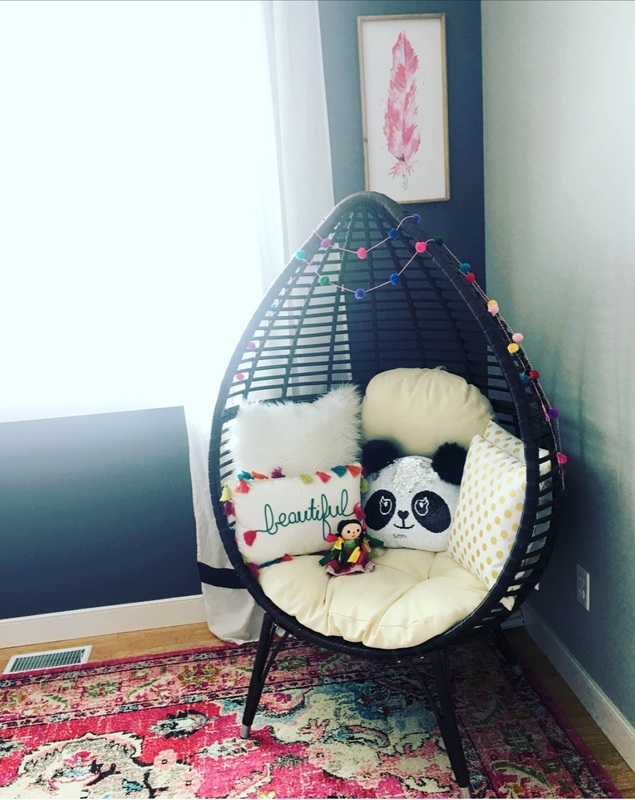 When she is older, it will be the coziest place to curl up with a book.